Quite why each version of the vSphere client does not work with any other version of ESX/vCenter I’ve never really been able to work out. Being a mac owner, I have to run the software in VMware Fusion anyway, (which is also a pain). So when I tried to connect my my own firms vCenter this week from my Windows 8 fusion VM, I got this error message, after having to download yet another version of the vSphere client. 1. Right click the installer executable > Properties. 2. 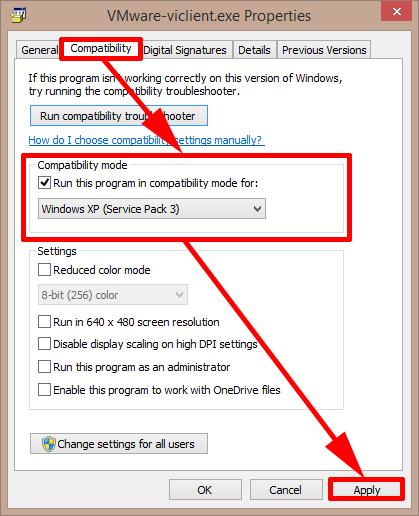 Compatibility > Run This program in compatibility >Windows XP (Service Pack 3). 3. Apply > OK > run the setup process again.